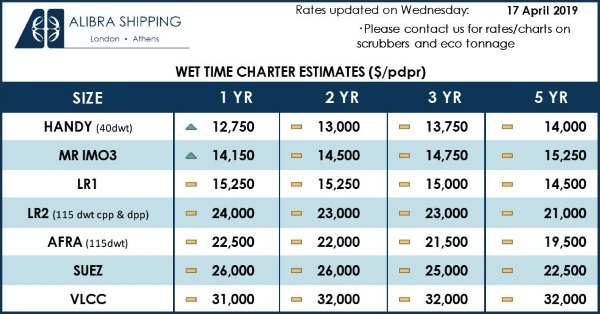 The Mediterranean market stands, in our view, as a growth story for tanker demand, indicated in our 2018-2022 Tanker Market Outlook in the context of rising crude production in the Caspian Sea and Libya. Although confident in growth, we also understood that some level of risk surrounded Libya due to domestic tensions. 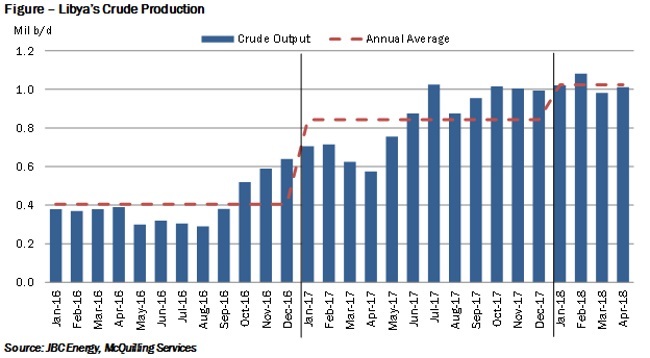 Towards the conclusion of 2017, it seemed as though tensions had cooled, allowing upstream operations to gain ground with crude production finishing the year at about 1.0 million b/d (Figure). Since then, we have observed output levels remain elevated, just over 1.0 million b/d and higher crude flows from the Central Mediterranean; however, recent news indicates that force majeure has been enforced on the back of armed conflicts. According to Libya’s National Oil Corporation (NOC), armed conflicts over control of oil export infrastructure has caused numerous storage tanks to catch on fire, cutting Ras Lanuf’s storage capacity by 40% and enforcing force majeure on exports from this port as well as Es Sider. The company stated that the immediate loss of crude production was 240,000 b/d, which then expanded to 400,000 b/d mid-week as infrastructure damage grew (picture below). We expect demand pressure for Mediterranean Aframaxes in the short-term with risk to the downside should clashes continue. At the moment, we understand that the Libyan National Army holds control of the ports, while NOC announced exports would resume in “less than a week;” however, the timeline is likely longer. 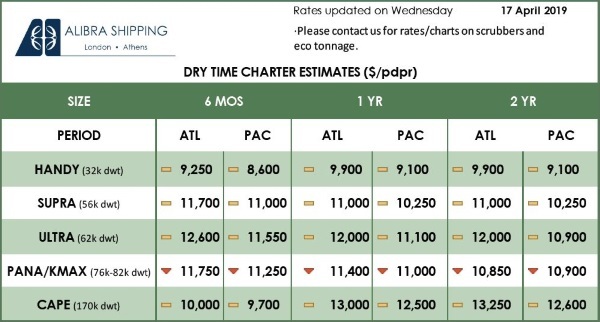 Rates on the Aframax trade TD19 (cross-Mediterranean) have come off recent highs as a result, last assessed at WS 80 at the time of writing, from a peak of WS 165 end-May, when a rush of activity hit the market. Demand pressure is likely to persist as export infrastructure remains damaged as well as a potential resurgence in conflicts. The majority of Libyan crude is sent to European refiners in the Mediterranean and Northern Europe; however, with force majeure on exports from two ports, we expect that these importers will seek alternative barrels in West Africa and the US due to the availability of lighter crude streams in these regions, similar to the composition of Libyan crude. Looking at regional crude pricing spreads, Brent-Urals Med is still trading below US $1.00/bbl and provides little incentive to source Black Sea crude. Demand support is likely to reside with the Suezmaxes in the Atlantic Basin with TD20 likely to average above our original expectations of WS 65 in June. Although increased reverse lighterage activity in the US Gulf has been a supportive factor for Aframaxes this year, we project increased demand pressure and building tonnage in the Mediterranean market due to Libya. Previous: Can the holder of a bill of lading claim damages for losses sustained by someone else?